The last thing that a B2B prospect wants to do when researching products and services is sifting through another piece of boring, repetitive content. Insert heavy sigh here. Your content represents your brand, and it has the possibility to either bridge the gap or widen the barrier between you and your B2B audience. My assumption is that you are aiming to the build a fruitful relationship! How do you do that? First, you want to be considered as a leader in your industry. Second, your products and services should be viewed as trustworthy. Third, your content should convey both of those points while also having depth and usefulness. It needs to attract your readers, maintain their attention, rally them towards action, and linger with a pleasant impression. I know what you may be thinking. “But my content is boring because my industry is boring…” Nope! There are no excuses. It doesn’t have to be boring! You can release your inner creativity and steer away from mundane, overly saturated topics. Spike up your personality, throw in some human emotions and relatable stories, and spice it up with humor. Think I’m asking too much? Nah. It’s easy. 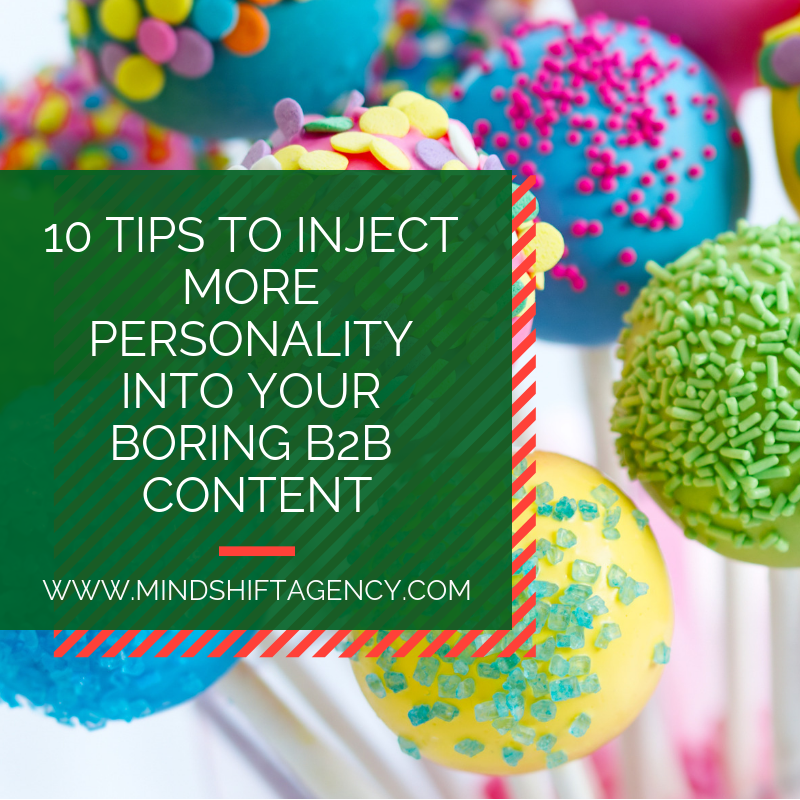 You can add more personality into your boring B2B content with these 10 easy tips! Tip #1: Write your article as if you were speaking to a peer. No need to impress your readers with fancy jargon or pompous vocabulary. Although it makes you look smart, it also creates a divide between you and your reader (because you amp up your intelligence which naturally makes your reader feel more dumb). No need to talk down to your readers either. Impressive words are often associated with being boring. But a familiar, authentic, likeable and engaging tone of voice is easier to relate to and feels more like a face-to-face conversation. Tip #2: Spice up your vocabulary and grammar. Wait, doesn’t this contrast point #1? Nope. Always double (or triple) check your spelling and grammar. Nothing is worse than reading a poorly written article and cringing at every mistake that you catch! But, it’s perfectly alright to highlight your main points or emphasize your peak emotions with appropriate slang, hashtag or an exclamation point. Tip #3: Provide a solution with an emotional yet authoritative response. I am not giving you permission to slam a political candidate or state your position on abortion just to gain a response from your readers. However, I am asking you to consider what your readers are dealing with; what are they struggling through or passionate about? Stray away from words such as “might” or “can.” Be clear, decisive, and offer a helpful answer. Your trustworthy authority and personal experience will help your readers solve their problems and be amazed by your personal experiences. Tip #4: Cite all facts and anecdotes. Half of all businesses are bankrupt. Actually that’s not true, but do you see what I did there? If you are going to cite any facts, anecdotes, research or statistics, you must provide a reference. This proves that you’ve done your homework, know what you’re talking about, and allow readers to look further into this topic if they are interested. It may be surprising that anecdotes and stories are included in this category. Let me remind you that real-life scenarios and personal stories have a much greater impact on readers because, well...they are true and memorable and solidify your point! There are two ways to reference things. The first, and easiest, method is to hyperlink the website to the text. Or you can add a list of references to the bottom of your piece of content. If you need help with proper citations, Knight Cite with come to your rescue. Tip #5: Write in active voice. Does this bring you back to your days of high school English?! Active sentences keep your reader moving along and don’t dally before the main point. Your reader will always be aware of the main idea and characters when you maintain active voice, instead of weighed down by confusing word order. Passive: It is believed by my boss that good products must be delivered by every client. Active: My boss believes that clients must deliver good products. Hint: the subject should always be the one doing the action (verb)! Tip #6: Ask rhetorical questions. Are you ready to learn how to use rhetorical questions to to engage your reader? Again, see what I did there? You’re such a fun audience! Anyway, asking rhetorical jump-starts your reader to think positively. Don’t overuse this tip though. We’ve all been around a curious 3 year old who never stops asking questions...there is a thing as too many questions! When you do utilize rhetorical questions, be sure that your reader can clearly answer, and hopefully with a positive response. If suspense was a person, it would be a sophisticated southern belle. She (the southern belle also known as suspense) gives the audience a reason to keep reading until the very end of the content. She does so tastefully and respectfully versus with manipulation. She starts by asking a few initial questions, but doesn’t promptly provide a complete answer. Instead, she slowly passes out the information that trails toward the final solution. And lastly, the southern belle ends her monologue with a succinct statement that fully answers the initial questions. Ta-da! Tip #8: Add in some humor. Here’s the thing about humor - it’s memorable! Researchers found that 80% of young adults were about to remember advertisements that made them laugh. So, make your readers laugh! It’s tricky. You can’t be a lame duck and you need to cater your style of humor to your buyer personas. Discover what makes your buyer persona laugh, and learn how to speak their language. And learn the art of humor from successfully (aka funny) comedians. P.S. It’s never a bad idea to let a few people read your content before you publish. Tip #9: Try out puns and metaphors. Humor can be a tough nut to crack. If that’s not your cup of tea, try out puns or metaphors instead. These tactics keep your reader engaged in what you’re saying while also giving them a bit of a mental break. It simplifies complex information into memorable and digestible nuggets. Personally, these are my preferred method of engagement! Tip #10: Be aware of your format. I bet you’re a brilliant writer who has captured your reader from line one, walked them through the meat of your content with humor and questions and cited facts, and delivered them to your call-to-action...ready to click for more! But help your reader follow the flow by breaking up your content into more white space that’s easy on the eyes (instead of reading like a novel). I totally believe that you can be a killer writer with these 10 pro tips! Want to improve your writing even more? Read fun (not-boring) content, and you will be able to write fun (not-boring) content! Discover other authors that inspire you and read everything they publish. Be inspired in order to inspire others. Try out a few of our tips and see if your B2B readers appreciate the non-painful, non-dry, non-boring content. Maybe you will even see a rise in comments and shares! P.S. Don’t forget the golden rule of content marketing: test, analyze, test, analyze and repeat until you find what works for you and engages your readers!